Following the path of Prudentius’ Psychomachia, in the Middle Ages the sword can characterize the representation of many Virtues, as generically proper to the Christian fighting the battle for his personal salvation. In contemporary culture this weapon is a specific attribute of Justitia, but, between the 9th and the15th centuries, it was primarily characteristic of another virtue, Fortitudo. The paper follows the evolution of both these representative traditions. First of all, it focuses on the very remote origins of the image of Justitia with sword, and on what led to the rebirth of this iconic formula after the year 1000. Secondly, and above all, it reconstructs the forgotten history and the complex development of Fortitudo’s representation as a warrior armed with shield and sword, unsheathed and upright. This essay traces the evolution of the personal and professional relationship of Italo Calvino and Leonardo Sciascia, using their divergent readings of the tales of the Sicilian folk hero Giufà as a yardstick for measuring their personal and professional association and their development as writers and thinkers. Thus, it sheds light on Italian literary culture as it took new form after WWII through the years of lead and the death of the two men in the 1980s; specifically, the two disagreed publicly as to how the Italian State should react to the terrorist threat posed by the Red Brigades in the late 1970s. Subsequent to these polemics Sciascia broke with Einaudi (the firm for whom Calvino, since the 1950s had edited most of Sciascia’s books). Then, in 1989 (four years after Calvino’s death in 1985), Sciascia, in perhaps the last essay he wrote, disagreed with Calvino’s 1971 characterization of the Giufà as a trickster and village idiot, as a sort of societal antibody, someone communities need to expel in the interest of their well-being. The work explores some landscape elements in the narrative production of Giulio Angioni. In particular, the study aims to enhance the dimension of “sprofondo”, variously declined, as a peculiar figure of the perception and representation of the landscape, in its historical-cultural, oneiric and etymological stratification. In fact, from the analysis of the narrative texts of Angioni seems to emerge a “speleological” tension in ‘the many ages lost in layers underfoot’, which remain in a close dialogue, even dramatic, with the present. Atonement by Ian McEwan (2001) is a novel structured around some key episodes that gradually shift the reader’s attention to the more self-reflective elements of the text. The centrality of the gaze, the voyeuristic attitude of the characters, and the multiple perspectives force the reader to return to scenes already “seen”, recalling, in the end, the reader’s own gaze from outside the text. The last pages, in particular, because of their manipulation of the events, make the reader the final witness. Starting from Lacan’s theory on the gaze, this article analyses how the traumatic scene observed by the younger sister, unbeknownst to the elder, serves as a mythopoetic device and it is at the origin of the mise en abîme on which the Chinese box structure of the novel stands. The repetitions of the trauma – first with the furtive reading of an obscene letter addressed to the older sister and then with the love scene in the library – mark the gradual prevailing of the imaginary on the real, until the final discovery of the fictionality of the whole story. In stage translation, the intercultural nature of drama and the varied addressees (actors and audience) of the target play demand a flexible strategy. Performability rightfully remains a fundamental feature, only recently legitimized, of any translation written for the stage. However, the relationship between translation, adaptation and rewriting is equally important in shaping the target play. This paper aims to introduce the director’s vision of the source play and of its possible dramaturgical improvements as a further reason behind the blurred boundary between translation and adaptation in theatre. Rumori fuori scena, the Italian version of Michael Frayn’s Noises Off, serves as the case study for a contrastive analysis which, in addition to the source text and its published translation, analyses the script currently being staged. The words of the translator and of the professionals involved are then essential to understand the practice of theatrical translation in all its steps, in order to truly devise a comprehensive theoretical framework of the issues involved in the operation. Despite the great importance that the early-fourteenth century Voie d’Enfer et de Paradis by Pierre de l’Hôpital had in the diachronic development of the allegorical voyage literary genre, it has drawn only passing interest from criticism. 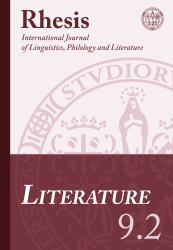 After placing Pierre de l’Hôpital’s composition and its re-writings in the purview of the oitanic literature, this paper sheds light on its manuscript tradition by both describing the state of the textual transmission and providing appropriate ecdotic comparisons that confirm the hypothesis of a bifid stemma, divided into two branches A-B and C-S. As it is evident, the results of this study constitute an indispensable preliminary contribution to the realization of the first critical edition of the poem which is currently being prepared.